During each episode we talk with fans, bands and industry experts to celebrate the past and present, and share stories about why we love live music. Every show is packed with concert news, live tracks, emerging trends and provocative discussions about the psychological, physiological and sociological impact that live music has on our lives. 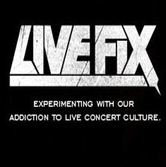 Join in and listen to the latest episode of Live Fix Radio.